You have likely been told on multiple occasions the importance of properly inflated tires. Maintaining the correct air pressure is safer, improves your fuel efficiency (saving you money at the pump) and extends the life of your tires. Thankfully, keeping your tires full only requires two tools: An inflator and a tire pressure gauge. But it seems like there are a thousand different tire gauges on local store shelves. How do you select the one that is right for you? While there are some important features all gauges must have, in the end, the correct gauge for you depends mostly on personal preference and intended use. Pencil: Simple and affordable, pencil gauges look a bit like a ballpoint pen. When pressed onto your tire’s valve stem, pressure forces a white column to slide out with a set of measurements. While pencil gauges store easily pretty much anywhere in your car, they are bit harder to read and can be more inaccurate than the other two gauge types. Dial: Also known as an analog gauge, dial gauges have a round display face (like a clock) that uses a needle to indicate tire pressure. Most analog gauges include features not found on a pencil gauge and are reasonably easy to read. Dial gauges take up a bit more space and are more susceptible to inaccurate readings after being dropped or knocked around. Digital: The most advanced of the three, digital gauges display your pressure reading on an electronic LCD screen (like a calculator). They tend to be the most accurate and they are more resistant to dust and dirt than other types. Digital gauges rely on batteries for power, making them slightly bulkier, but as an added bonus, some digital gauges are backlit to allow for easy readings in darker spaces. Storage: Do you need something that is compact and fits in glove box? Or will you be storing it in your workbench? What about a keychain design, or something that can fit in your bike bag? Tire Type: Consider the types of tires you will be checking. 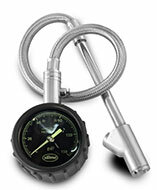 A tire pressure gauge for a standard tire ranges from about 5-60 PSI. Larger tires typically require higher reading capabilities in the 10-160 PSI range. Make sure your gauge covers the range of low and high pressures that you anticipate checking. Hose: Some gauges come with a hose to fit any rim, no matter the shape or size. If you expect to check deep wheel wells, a hose is generally preferred for an easier reach. Other Features: Want to get really fancy? High-end gauges can come equipped with bleeder pins (to remove excess air), liquid-filled dials (for a more accurate reading), or with a dual head design to make checking dually, SUV and RV tires easier. You are now a tire pressure gauge expert! 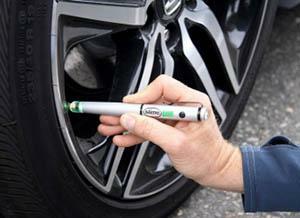 Here are some parting tips when using your new tire pressure gauge. Don’t drop it! Gauges become inaccurate when they are knocked around or hit the ground. Check your tire pressure once a month to maintain proper air pressure. For the most accurate results, check your tire pressure when your tires are cold (parked for 3 hours or more). I really like that you mentioned that by getting a digital pressure gauge, you can measure the pressure even when it is dark. I want to check the pressure in my tires, but only have time to do it at night. I will be sure to get a digital gauge.